The Bottom Line: If you are anything like me and love the feel of your sleeping bag, then you are looking in the right place for a new blanket. If you are frugal like I am, then this will be a hard pill to swallow, particularly as you get the larger sizes. We now own two one-person sized blankets, and I wish we had them in every room of our house. 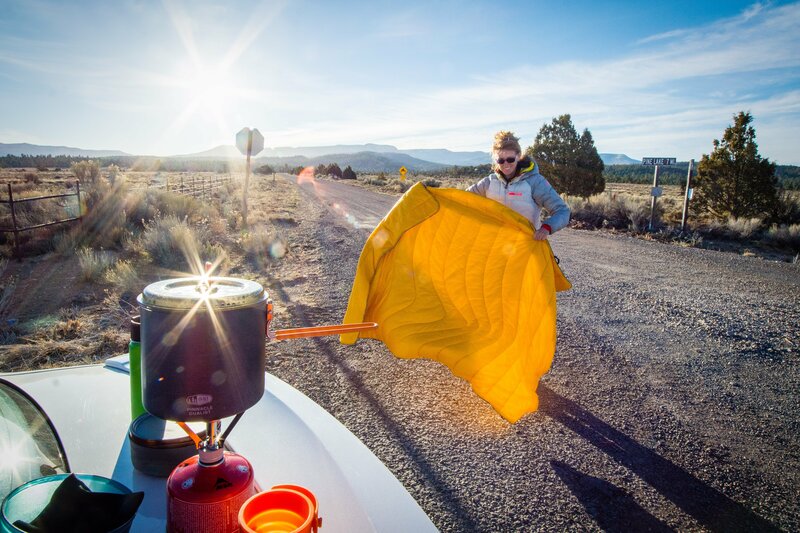 It has become a staple for car camping, our dog (she loves them), and nightly use (no more stolen blankets!). My biggest regret is that I did not get the down version so that I can take it backpacking. The shaking off a little dust from the Rumpl Original Puffy Blanket. Photo by Jason Leach. Rumpl's Original Puffy Blanket (according to their website) was conceived in a "broken down car on a subzero morning" and was designed to combine weight, comfort, and performance into a compact package. My first thought when we got our Rumpl blankets was to protect them like our sleeping bags. So I quickly removed it from its stuff sack and just laid it on our gear shelf where it sat unused for a few months. It wasn't until we planned a car camping trip to Zion, Bryce, and Arches national parks in late April that I decided to just throw them into the car alongside our sleeping bags. While technically still winter, it had been unusually warm, so I did not expect to use them. My fiancée, Rachael, sleeps cold, however, so I figured why not. Part of this trip was was for photography, which would mean cold mornings, late nights, and long exposures (read: lots of standing still in the cold). We left after work on a Thursday, and we hit a snow squall just past Moab that dropped visibility to zero and slowed all cars on the highway to a crawl. After an hour of driving slowly (and not getting very far), we opted to pull off at a rest area around 11 p.m. I used my sleeping bag in it's stuff sack as a pillow and yanked out the Rumpl to throw over myself; Rachel opted to get into her sleeping bag but used the Rumpl in it's stuff sack as a pillow. We both slept comfortably for a couple of hours as the storm passed; the car thermometer read 32 degrees Fahrenheit. While temperatures were not as cold as they would be in the morning, we did appreciate the convenience. After a day exploring Zion National Park, we headed to the Airbnb we booked. This time we opted to use our two Rumpl blankets on the bed, and I discovered another great thing about them: The one-person size means I do not have to share my blanket! Generally I sleep warm, so I figured I would throw off the blanket at night, but the nylon fabric felt very comfortable next to my skin, and it felt surprisingly light for how well it regulated my temperature. I point this out because we have a heavy down comforter at home, and I expected the same weight from the Rumpl blankets. However, like a sleeping bag, their warmth to weight ratio is very high. This may not appeal to some: My fiance likes a bit of weight from a blanket to help her sleep; I, on the other hand, do not, and the Rumpl fits the bill. Besides the weight, the one-person size is perfect for one person. I am 6 feet tall and it fits me comfortably, and most importantly, it fits just me. While I realize that some folks enjoy sharing a blanket, in our household, that usually means someone ends up with all of it throughout the course of the night. With us each having our own one-person Rumpls, that problem is solved. I enjoyed that night at the Airbnb so much that I sleep with my Rumple blanket every night now (and so does my dog on most nights). Something I wasn't expecting about the Rumpl is how convenient a tool it is for photographers. I spend a lot of time in cold environments. I love them. That also means the folks I am with spend that same time in the cold, and their response is usually a mixed bag. We spent the night at our campsite outside of Bryce and set the alarm for 3 a.m. to catch the peak of the Milky Way for that time of year. A big part of photography is using your feet to find a shot (over the lens), so we were slowly wandering, taking some test shots (about 30 seconds in length each), and generally standing around in the cold. By now I would have expected some words from my partner, but she was perfectly content with her Rumpl wrapped around her down jacket and legs. Eventually, we found the right spot, which led to more standing in the cold (I did not get a temperature reading in the canyon, but I could see my breath), and again I was impressed: no words. Afterward we made our way back to the car to wait for sunrise, Rach was perfectly content, and I had discovered a great new tool for photography when I am able to bring it. The last thing I would like to point out about the blanket is it's durability. This was a huge concern of mine as I have torn tents, sleeping bags, and sleeping pads on seemingly nothing. As we discovered how awesome these blankets, were we started using them more regularly. As mentioned, I sleep with mine nightly. This also means my dog (and her claws and teeth) sleep on it as well. At 2 years old, she still likes to take a chew or scratch at things, including our blankets. While I never let her chew on it, she certainly has taken a few test bites and sleeps on top of it regularly. Suffice to say it has made it out unscathed. The ripstop nylon and seam construction is bomber, and I have no doubts that it will last us for a long time (we've had them for a little over eight months). My biggest regret is not getting the down version. While more expensive, the down version packs to about half the size, meaning I would be more inclined to take it on backpacking trips when I could go without a full sleeping bag or throw it in my carry-on for travel. That is the biggest downside I have seen to the original Rumpl: It's packed size makes it relegates it to car camping and domestic use. But that's just fine, because I finally have a blanket all to myself!